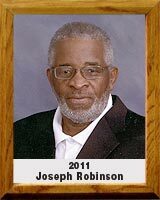 Joseph Robinson has been officiating softball, football, basketball and baseball since 1954, including calling games throughout the world while serving 26 years in the U.S. Air Force. Robinson got his start at 17 years old in Wilmington, North Carolina, when an umpire failed to show for a baseball game. He started working high school football games in 1970 and continued until 2006. In addition, Robinson called men’s fast-pitch softball, NCAA women’s softball, and high school softball, starting in 1975. Robinson was appointed Arizona ASA umpire-in-chief in 1981 and to the ASA National umpiring staff in 2007. He served on the National Federation High School Rules Committee for Softball for four years. Robinson umpired in 19 ASA national championships, the Women’s College World Series in 1978, Men’s major fast- pitch at the National Sports Festival, numerous high school state championships in Arizona and has been umpire-in-chief for more than 15 national championships throughout the United States. He remains active by refereeing football games in the Independent Women’s Football League and as part of the national umpiring staff in the Rocky Mountains area in training softball umpires. Robinson has received the AIA Superior Achievement Award for 20 years as a football official, a Dedicated Service Award from the Tucson Football Officials Association for 25 years of service, an award from Tucson Pop Warner Football for 25 years of service and an award pin from the ASA for 45 years of service.